(Reuters) - An electric guitar played by George Harrison on British television prior to the Beatles' "invasion" of the United States will go on the auction block along with a rare album cover signed by the Fab Four, Julien's Auctions said on Monday. Harrison's black-and-white 1962 Rickenbacker 425 electric guitar is expected to fetch between $400,000 and $600,000 at an auction on May 16-17 at the Hard Rock Cafe in New York City. Harrison, who died in 2001 at age 58, played the guitar on 1963 appearances on British TV shows "Ready Steady Go!" and "Thank Your Lucky Stars" months before the group brought Beatlemania to the United States with a series of performances on "The Ed Sullivan Show" in February 1964, launching the British Invasion of rock bands. 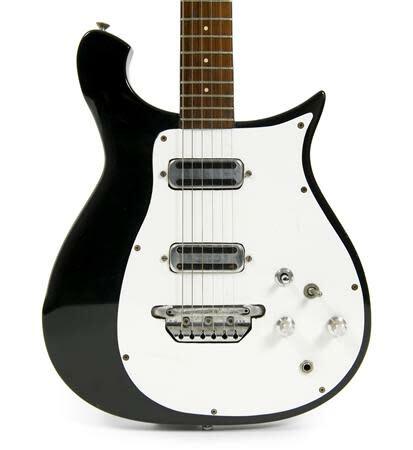 The guitar, which Harrison had painted white and black to match John Lennon's Rickenbacker guitar, was also used during the sessions when the band recorded "I Want to Hold Your Hand" and "This Boy" in October 1963. Harrison later gave the guitar to friend and musician George Peckham, who played it in an appearance on UK TV show "Top of the Pops" with the band the Fourmost. Also up for sale is a copy of the album "Beatles '65" signed by Lennon, Harrison, Paul McCartney and Ringo Starr. The album is expected to fetch between $200,000 and $300,000 because it was rare for all four members of the group to sign copies of albums after their popularity exploded in the United States in 1964. A used Hofner bass rented by McCartney in the mid-1960s is expected to sell for $30,000 to $50,000, while a signed cover by the group of the 1963 album "Please Please Me" is expected to bring in between $40,000 and $50,000. An original artwork by Lennon called "Shroud of Tourin" is estimated to sell for $20,000 to $30,000. The piece of un-stretched canvas, created circa 1966, shows a man who looks like Lennon with a Batman symbol on his chest and words scrawled across it.